There are some basic rules about all seafood – it should be cooked fast and preferably within 24 hours of purchase, 12 hours is even better. If using frozen seafood, make sure you thaw it correctly, according to instructions. Lobsters have a very basic nervous system and no real brain, so killing a lobster needs to stop the processing system that pumps fluids around its body. There are two ways of doing this, before cooking or during cooking. If you’d rather know your lobster is dead before cooking, put it in the freezer for at least two hours – this stops the nervous system pumping and sends it into a death coma. The other way is simply to boil the lobster by lowering it headfirst into boiling water. Never remove the bands from live lobster claws: they are there to stop you getting damaged or lobsters attacking each other. To cook, weigh your lobster, then half fill a big pan or fish kettle with well salted water and bring to a rolling boil. Put the lobster in and bring back to the boil When the water boils, time the cooking, allowing 15 minutes for lobsters up to 700 grams (1.5 lb) and 5 minutes per 500 grams (1 lb) over that weight. Then pour the whole pan into the sink and wash with cold water to remove any residues. When the lobster is cool, pull off claws and crack them with a light hammer or heavy cleaver to remove the white meat before pulling off the tail and peeling it, as though it was a prawn. Cut the body in half lengthwise, using a heavy knife or cleaver. Remove the gills which are grey and feathery. Please try to kill your crab before cooking. There are several reasons for this: it means there is no suffering to the creature, but also when a crab is put directly into boiling water it tends to shed its legs and claws and finally not killing and cooking live crab makes the meat tougher and can also cause it to retain water in its shell. To kill a crab place it on its back with the legs up. Look for a small pointed flap towards the rear of the shell, if you lift it you’ll find a small hole. With a small screwdriver push firmly down into this hole, adding a strong tap to the top of the screwdriver when you feel the other side of the shell and then move the handle of the screwdriver sharply and strongly towards the back of the shell before withdrawing it. Then you can put the crab right side up in the sink and leave it to drain for a few minutes. Cook as for lobster above, but allowing twenty minutes for crabs up to 900 grams (2 lb) plus 5 minutes per 500 grams (1 lb) over that weight. When the time is up, carefully pour the whole lot into your sink and wash off the crab with fresh water to remove any surplus protein. To prepare cooled, cooked crab: twist off the legs and claws and set aside. Use a chopping board, wooden if possible, and set the crab with the head pointing upwards on the board, knocking the bottom edge on the board. Then set the crab with the dark side down and use your thumbs to push the centre up and out of the shell. Make sure you remove and throw away the stomach sac which is a small grey-white bag found just behind and below the mouth at the same time pull or cut away the gills, attached along the edges of the centre part. Now you can cut the centre into quarters and scoop out the flesh before opening the claws by giving them a strong tap with a rolling pin and remove the white flesh. Repeat for the legs. 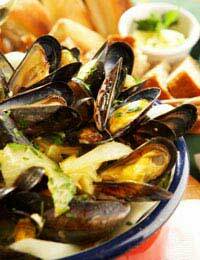 Begin by throwing away any mussels with damaged shells and any that remain open after tapping sharply on a chopping board – they will be already dead and could cause illness. If necessary, scrape the mussel shells clean using a blunt knife and remove grit or mud by washing several times in cold fresh water before pulling out and throwing away any stringy beards. Now soak them in cold water for around fifteen minutes. Throw away any that float to the top as they too are dead. Cook for two or three minutes only and ensure the muscles that hinge the shells are open – any that remain closed should be thrown away.